Southsea Castle was built in 1544 and took less than six months to build. It was built as one of a series of forts constructed for King Henry VIII and it is said that the King himself designed the fort. It was not long finished when in 1545 the Mary Rose sank in full view of the castle to the horror of the king. In 1627 the castle was gutted by fire and in 1642 the castle was captured by Parliamentary forces in the civil war. In 1683 Charles II inspected improvements to the castle and then in 1759 the castle was damaged by an accidental explosion. A few years later between 1813 and 1814 reconstruction was carried out. Between 1844 and 1850 the castle was used as a military prison and in 1863 work began on building the east and west batteries. 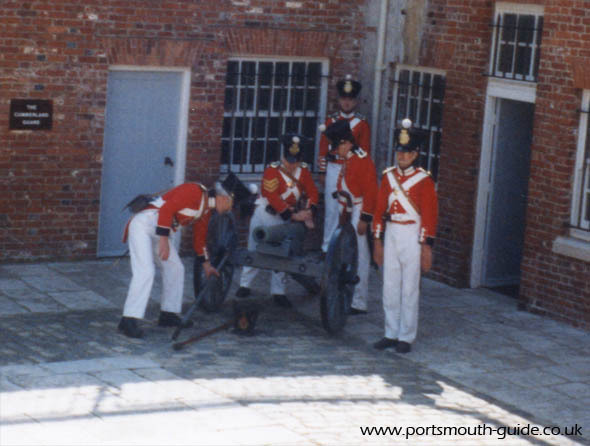 In 1899 there was the installation of 6 inch and 9.2 inch guns and then in 1960 Portsmouth City Council purchased the castle and in 1967 it was opened to the public. The castle is situated in a key position guarding the entrance to Portsmouth harbour and this meant that whatever danger threatened Portsmouth the castle was in the front line. 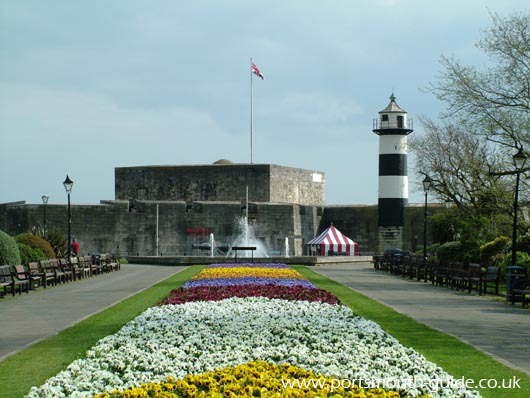 Southsea castle has many features of interest and includes a history of the castle. If you climb to the top of the keep you can get some good views across the Solent and Portsmouth. You have the opportunity to enter the Counterscarp gallery which was built between 1813 and 1814 and goes round the moat of the castle. The above photo shows Southsea Castle which is located just behind the D-Day museum and as can be seen is on the edge of the coast. There is also a chance to climb all the battlements around the castle. As well as the regular attractions there are often displays by various re-enactment groups. Including the Fort Cumberland Guard. They are a re-enactment group of people who put on drills as would have been carried out by marines in a bygone era. They fire muskets and cannons, do marching drill, have their own band, perform the ceremony of the keys and sunset ceremony. The ceremony of the keys is when each door and gate in the castle is locked by a detachment of the men and then the keys are handed over to the garrison commander. Sunset is then played and the castles day ends. The Fort Cumberland Guards displays are well carried out with high accuracy and will keep you entertained for a long time. 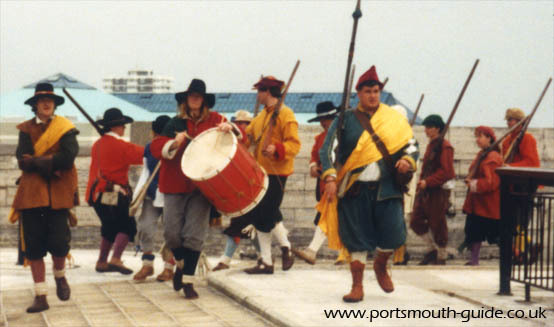 The Castle also hosts other re-enactment groups performing their drill from various times, the above photo is an example of this. Other groups have included Henry VIII, Kings Hussars and Round Heads and Cavillers. For more information about Southsea Castle please click here to visit the Castle’s official website.